Colman Domingo proves that not only is he a solid actor; he is also a playwright to be reckoned with. "DOT" is a hit! 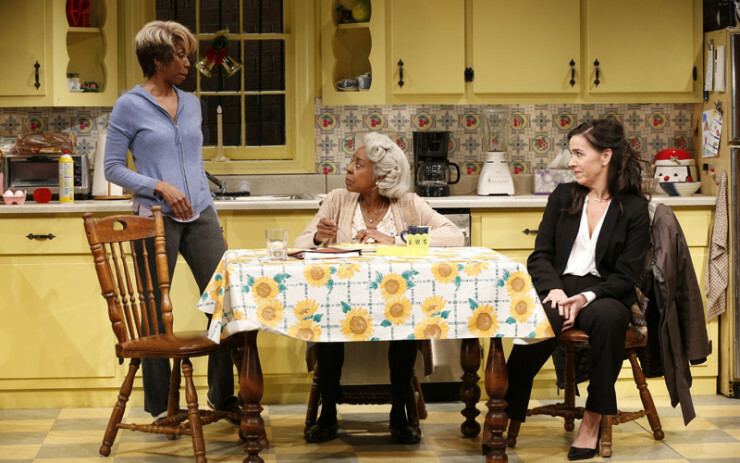 “There is only one moment of sanity in anyone’s day – coffee,” declares Shelly, the Shealy family’s eldest and primary caretaker for DOT, their matriarch and the title character of Colman Domingo’s new play at Vineyard Theatre. In this riotous drama about failed aspirations, redemption and the memory, chaos cripples the Shealy family’s ability to decide on how to handle their mother’s (Dotty) care as they individually learn she has Alzheimer’s. Using the Shealy house as a backdrop Domingo cleverly parallels the way things used to be for the family, with that of the rest of the country. Dotty (Marjorie Johnson) and her late husband settled in their West Philly neighborhood in the 1960’s in pursuit of the American dream, but instead witnessed white flight give way to urban decay. The Shealy kids – Donnie (Stephen Conrad Moore), a struggling gay music critic in New York City; Averie (Libya V. Pugh), the Instagram-famous baby girl; and Shelly (Sharon Washington), the lawyer – all have different realities of the disease’s progression and the role they need to play in the rest of their dear mother’s life. It’s Christmas and everyone’s home, including the Jewish girl from New York City who grew up next door to the Shealy’s. Jackie (Finnerty Steeves), whose parents have now passed, has her own existential crisis only to realize she needs to curb her enthusiasm to rally around the black family she considers her own. Dotty’s turning point with Alzheimer’s seems to also serve as a catalyst for the exchange of her children’s own deferred dreams for re-imagined futures. It’s clear that this is the last Christmas that they’ll have with their mother, even if she’s there a moment and gone the next. After brouhaha and intense ‘reading’ sessions, the trio resolves to give their mother what she wants. She wants to hear her son Donnie, who was classically trained in piano, play “White Christmas” one last time on the baby grand. She wants her darling Averie to sing along. She decorated the tall Christmas tree she so gleefully wanted to decorate, twice. She couldn’t remember the first time. All that matters is Dotty’s happy; after all, the kids are home for the holidays. I found it especially brilliant that Domingo created a script that showed each character adjusting at a different stage of grief, simultaneously. DOT is warmly written and, from the audience, it actually feels like you’re home for Christmas. The directing, by Susan Stroman, is notably splendid, seeing what her background in choreography brings to the piece. She and Domingo are teaming up for the second time, the last being The Scottsboro Boys where they both received Tony nods. Domingo’s nomination was for Best Performance by an Actor in a Featured Role in a Musical and Stroman’s two nominations were for Best Choreography and Best Direction of a Musical. As the swell of great memories rescues each of these characters from their own troubles, they find purpose and family are synonymous. Domingo, who stays true to his Philadelphia roots, offers a magnificent portrayal of a black family. I highly recommend DOT.